Above is a very short film (my batteries ran out) of people singing a Bulgarian folk song we all learned in a Singing Society Workshop of Bela Rechka Songs at the Goat Milk Festival. Of course, we sang it in Bulgarian but the English translation really got me thinking. The lyrics are pretty funny in a sort of sinister way. They made me ask all sorts of questions in my head – were the narrator and the object of his affection involved in an affair? Or, what creepily occurred to me, was he a total stranger/mild acquaintance to her? Was she blissfully sailing through life, happy with her husband, unaware that this man silently watched them whilst they slept, plotting murder? Is this song the narrator’s declaration of a fully requited love, or the moment some poor woman learns she’s being stalked by a psychopath? Have I watched too many thriller films? The mind boggles. What was there for me to get. Trusty friend, my sharp-edged knife. You and he were fast asleep. For to crush him like a crumb. That I’ll burst there on the spot. And the dawn was shining bright. Through the quickset back I fled. Last night in the chilly dew. It is either he or I.
YouTube – grey fluffy clouds – I’m sure this will be old news to many, but this spoof of The Orb’s Little Fluffy Clouds made me laugh like a drain. Courtesy of The League Against Tedium (via Sandra Hall). This guy’s video of it gets extra speshul points for mishearing ‘Watford’ as ‘Walford’. …an event that tries to put the questions about personal memories and collective memory (a ?high voltage? question in our society) in a new perspective and environment – offering at one hand the relaxed ambiance of one authentic Bulgarian Balkan village like Bela Rechka with its hospitality, goat milk and walnut trees and, on the other hand, innovative and new approaches from the European debates and art world in the field of memories, identity and new culture. As you can probably guess, it was pretty amazing and although I’m not going to blog any big conclusions from the experience just yet, I’d like to put a couple of odds and ends here. Thanks to a lost camera, they don’t amount to much but there are a couple of recordings I wanted to publish. 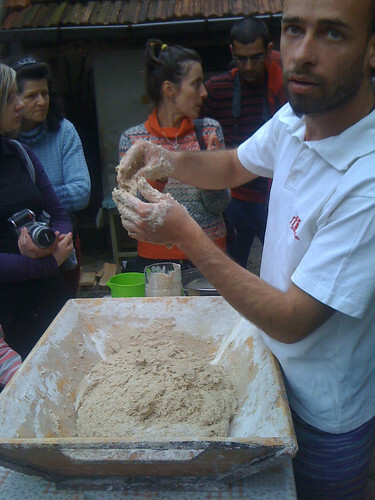 The first is a small clip and photo from a bread-making workshop at the festival, lead by the baker at Sunmoon Organic Bakery & Vegetarian Restaurant in Sofia. If you ever find yourself in Sofia, be sure to seek them out for a good meal washed down with some nice beer.